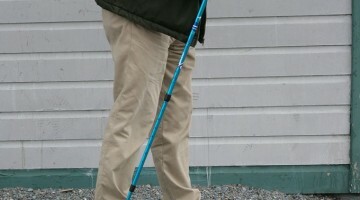 They are just as likely to look at you and go, “hey, where’s the snow?” because the ancestor of Nordic walking poles is cross-country ski poles. 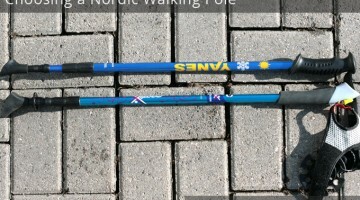 It was an interesting question for me, that of what would happen when a Nordic pole actually met snow. 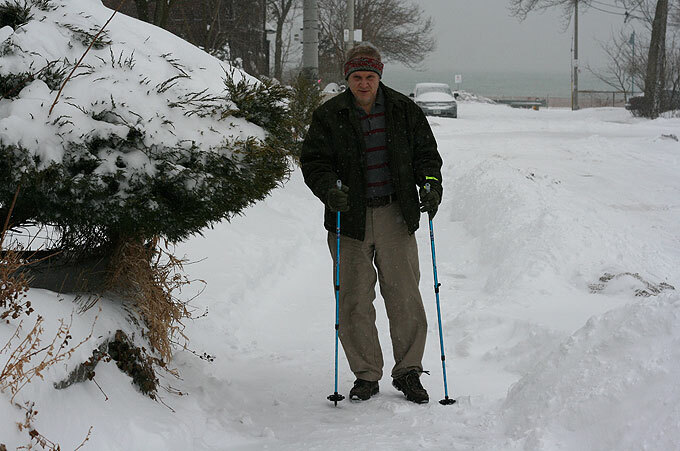 This was my first winter as a Nordic walker, and my first chance to find out. When I ordered the Nordic poles, I also ordered at the same time a pair of doo-hickeys that are apparently called “snow baskets.” I hadn’t even used a pair of Nordic walking poles yet ever in my life, but I had a feeling that after all my research and thinking I would like it and stick with it, and the “baskets” were only 12 bucks, so I tossed them into my shopping cart at the same time. What you do for snow conditions is take off those rubber tip feet to expose the hardened metal tips on the poles, and screw the baskets on. Little did I know in the fall of 2013 that my first winter of Nordic walking was going to face a baptism of fire. The winter of 2013 turned out to be one heck of a winter, one of the hardest in a long time all across North America, with even the American deep south getting some real winter for a change. We had good solid snow cover from the start of December through to the time of writing here, the middle of March, which we haven’t in years. So, the snow baskets had, to say the least, more than an occasional temporary dusting of snow to be tested in. Having now experienced the use of these pole snow baskets in winter, I’m going to start by saying the following. First, they aren’t of course of any help on surfaces that have been cleared of snow, such as sidewalks, trails or roads — that of course is a given, because they are about 3 inches above the ground. Secondly, I think they’re helpful somewhat in shallow snow; and I think I noticed once or twice them being useful in packed snow, and when crossing deeper snow whose surface was ice-encrusted. I wouldn’t go so far as to say they provide “flotation”, as some commentators say they do. The poles still sink into the snow quite far; in fact, it seemed the poles sunk in far as they would without the snow baskets on. When the poles first arrived, I noticed that included with them (free) was a pair of smaller kind of baskets, but simpler and solid. Apparently they are called just plain “baskets”, or “performance baskets.” They apparently help you in loose soil, and help keep your trekking pole from getting wedged between rocks or tangled in damp grass or debris. Well, why I mention them is that I’m tempted to think these free “performance baskets” might have done just as good a job — or non-job — as the “snow baskets” did, for all the perceived benefit I thought I got from the snow baskets. But, I keep telling myself, the snow baskets must help or they wouldn’t make them, and I just didn’t notice or appreciate how much a difference they made. I did lose a snow basket twice when it got caught under the weight of some packed snow and came off. I guess I didn’t have it screwed on tightly enough. Thankfully both times something made me look down, and I was able to retrace my steps and find it. Lesson: screw them on as tight as they will possibly go. So to sum up, to convert the poles for winter / snow / ice, you expose the metal tips (meant I guess to dig into ice), and screw the snow baskets on. And there above you see the prepared poles in action in the snow — with tip exposed and snow baskets in place. Even if I’m not convinced the snow baskets actually did anything, they sure made me feel and look more “snow equipped”, and maybe that’s worth something! 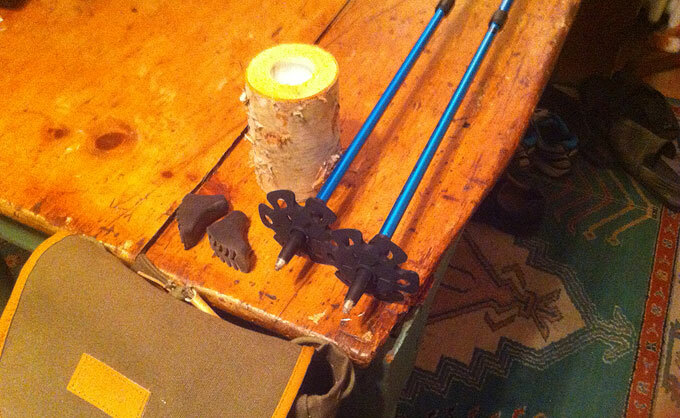 I quickly learned, though, that the real winterproofing needed was not so much the poles as the sole of your footwear. A solid, reliable foot-step that you can count on is I think really important in Nordic walking because when you’re norking, you kinda zone out and your mind goes into auto-pilot and you aren’t really paying attention to every single foot step near as much as you would normally. 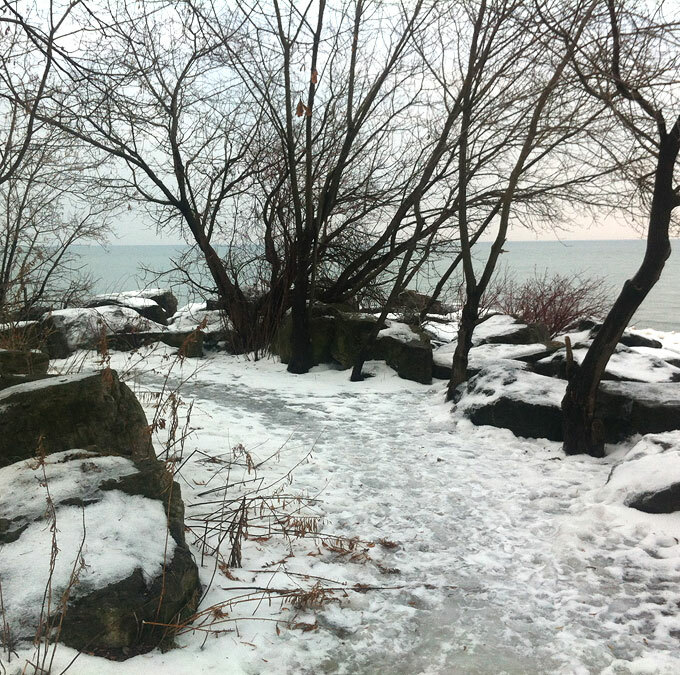 This was a hard winter, but most of all it was an icy winter — Toronto even officially had an official ice storm at the end of December, and that layer of ice just stayed as part of the snow strata all winter. Walking on fresh, powdery snow is one thing. 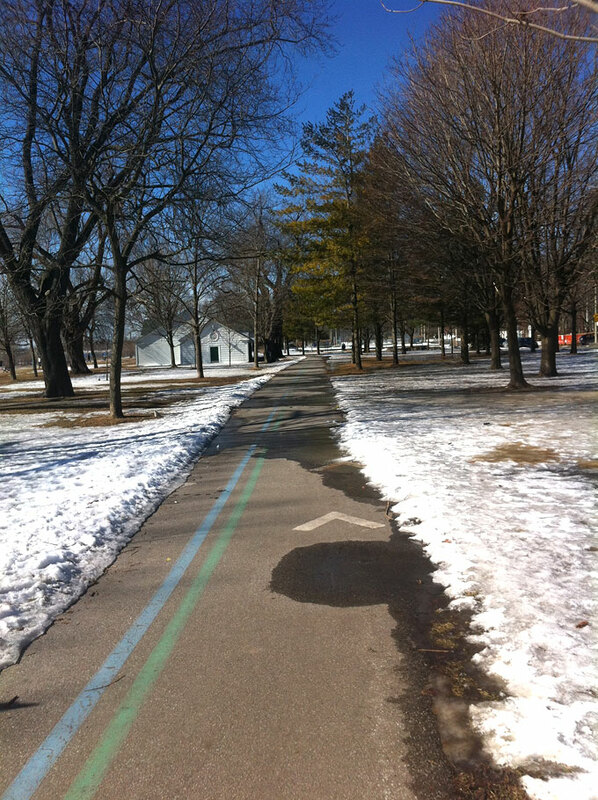 But see these icy fitness trails in the picture below — that’s another thing. And that’s what the fresh. fluffy snow looks like the next day after all the joggers and dog walkers have been all over it, and it melts a bit, then it re-freezes into rock hard, uneven, slippy ice. And while the pole tips will dig a bit into the ice (that’s the theory anyway — I’d say it’s not as though you’d notice), and the poles themselves provide a bit of stability, none of that matters a hill of beans when you feel your feet just plain going out from under you and your arse approaching the ground at high speed. 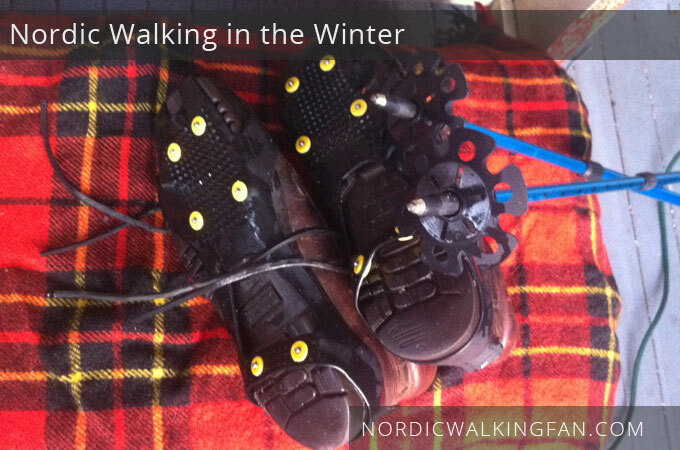 The soles of your footwear, it turns out, are the truly vulnerable aspect of winter Nordic walking. So, I pressed into service some “boot traction devices” that I’d bought about 10 years ago, but hadn’t ever really used as the winters had been so mild since then. You don’t want to wear them on a cleared sidewalk or you’ll sound like an idiot from the nails clicking on the pavement, but they work great on iced up surfaces. 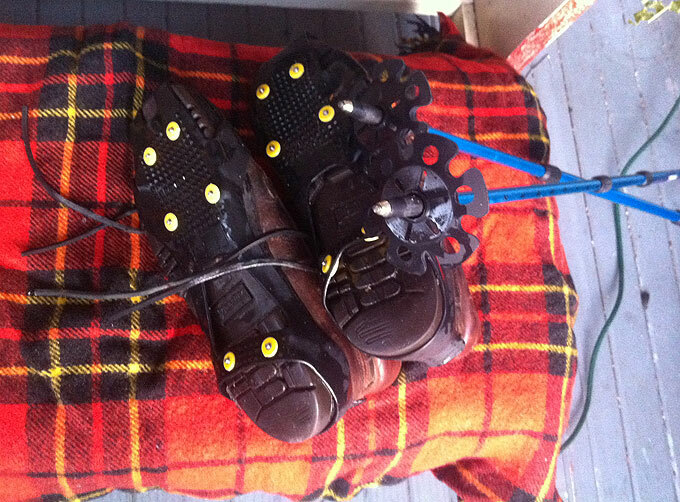 I used them for a couple of sessions over some icy terrain. Though, being a calculated-risk kinda guy at heart, I did ask myself if there wouldn’t be a patch of ice on which my luck would run out. 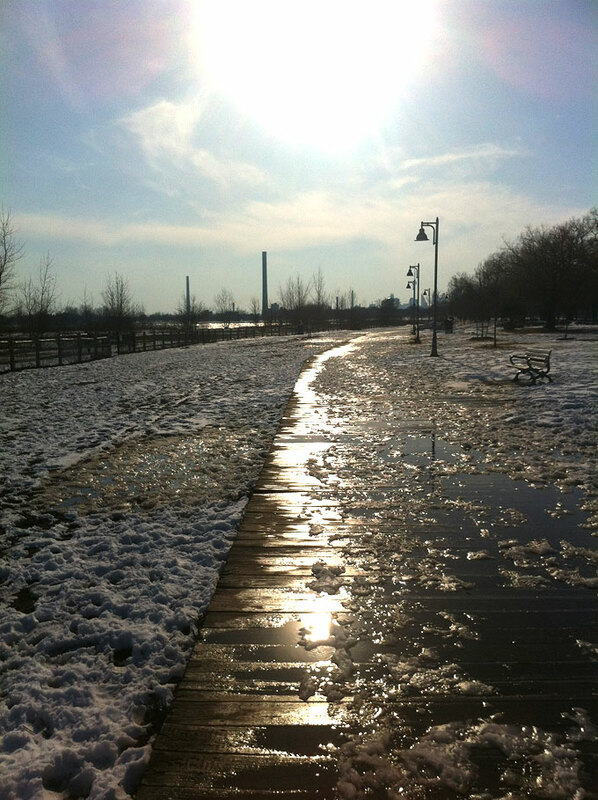 And sure enough, eventually, after a couple really close calls on an icy boardwalk such as on days pictured below (the worst is when the ice is uneven and melting just a bit to make it extra slippery) …. … I just said to myself, Randal, get a clue — there’s just nothing “fit” about spending six months in a hospital bed with a broken hip. You can miss a few days or even a few weeks, and you’ll pick it back up when it’s safe, and sensible, to do so. So that’s what I did. 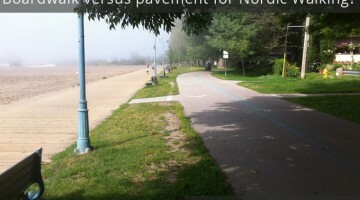 I gave up the daily Nordic walking when it wasn’t safe to do so. In fact, maybe to tell the truth I only got out four times since January, because every surface was iced up and stayed iced up. I did not berate myself or feel guilty, because I just knew how much I’d be kicking myself for being stupid if I slipped on bad ice and broke something. What matters is long-term fitness, which is easier if you don’t have a broken leg! But look — it’s March now. Look at the picture below. If you are a Nordic walker living somewhere where there is actually a, um, Nordic winter, what is your winter Nordic walking strategy? I’d genuinely like to know; I’m not sure my “sitting it out” approach was necessarily the best.